This year I'm determined to follow along with the Tim Holtz 12 Tags series - click here to see the January Tag. The 12 Tags series has been going since 2012 now and Tim just keeps on coming up with ideas and inspiration. Of course we all know that it's sometimes difficult to make time for everything we would like to do and the TH tags was one project which fell by the wayside for me last year. To motivate myself to keep it going this year, I thought it would be fun to make some special storage for them. Then I just used PVA glue to assemble the box, using the tabs you can see in the photo. After this I even went on to cut all twelve tag bases from scrap card, so they're ready to go and there's no excuse! This was so simple and fun to put together and could easily be made in different sizes and styles - I will probably make a smaller, prettier one for my Tag Tuesday tags. As it's so straightforward I didn't think it warranted a tutorial as such, but if anyone would like to make one of these and would find more detailed instructions helpful, just let me know (there's a contact email on the LH side bar). Great idea, Annie! I first imagined this to be quite large,but now realize that it's probably rather small to fit the tags. It looks snug and well-made. I look forward to seeing all the beautiful tags that will go in it! What a fabulous, FABULOUS idea..,& from scratch! What's clever clogs you are:) it looks really neat & I'm positive it will help you get those tags done!!! So happy you joined us at LESSOLOGY this month too!!!! How cool is this! 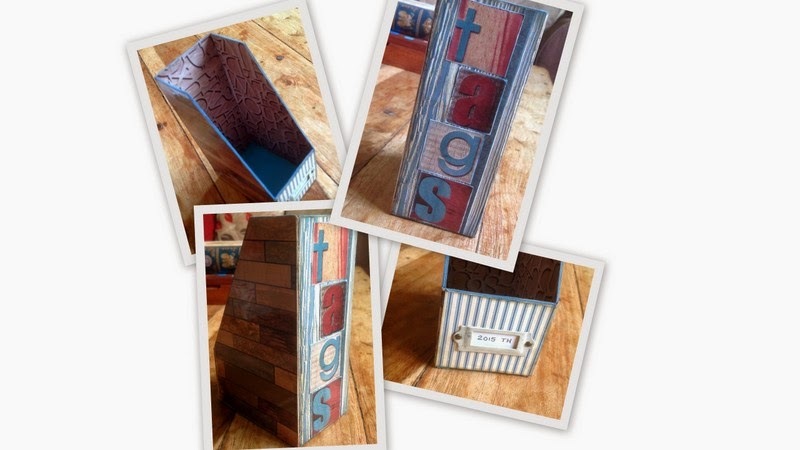 Love the idea of making a storage unit for all your tags! How awesome! Miss Lizzy Hill always has good stuff on her blog, totally agree! this is super awesome cool! Love how you are thinking ahead to keep moving on the tags! hugs for playing along with us at LESSology!